Advanced coaching, proven strategies, accelerated results. FINALLY! You get the exclusive opportunity to tap into Jonathan Sprinkles’ million-dollar mind! 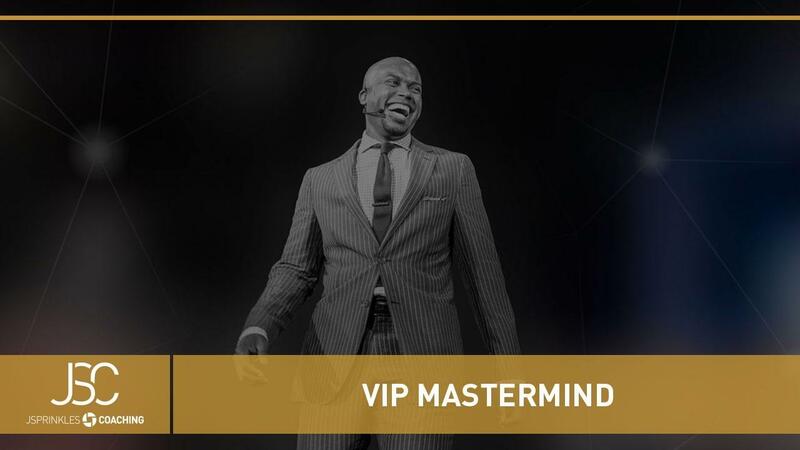 For the first time ever, Connection Coach Jonathan Sprinkles is giving you access to content that he only shares with his exclusive high-end coaching clients. To celebrate Presentation Power’s 10th Anniversary, Jonathan has opened up 10 virtual seats to his private mastermind in Houston, Texas. For two days, you will learn business-building strategies along with the live audience. Jonathan teaches a special “bonus session” on attracting your ideal customers, accompanied by live Q&A by the attendees in the room. Listen in as the people in the room help the person in the “profit seat” who needs help on a specific goal or challenge. You will be amazed to hear the ideas from people from multiple industries who have a unique perspective that will challenge your status quo. Eavesdrop on veteran attendees asking questions you wouldn’t think to ask but need the answers to. Jonathan will teach sessions on handling objections, creating a compelling value proposition, creating topics that get shared, social media strategies to connect with your target market, and more. INCREDIBLE VALUE. You get to tap into Jonathan’s Million-Dollar Mind for a fraction of what it would cost you to purchase a live seat. Jonathan is expensive…and he’s worth every penny. You get all of the benefits without leaving your comfortable home or your favorite work area. You risk almost nothing. LIMITED AVAILABILITY. This has never been done before, so only a few seats remain. Missing this means that you likely won’t get the in-depth answer you need until Presentation Power in July. ONE IDEA. If you get just one idea that takes off, this investment pays for itself. Just think about it…how much would one new client, new contract, or one speaking engagement put in your pocket? 1 complimentary ticket to Presentation Power ($797 value) Access from all your devices. Risk-Free 14-day 100% satisfaction guarantee. Comments section: Ask Jonathan anything!